"I've noticed a great deal of confusion surrounding the legal rights of the deaf. Both deaf and hearing individuals have difficulty understanding what accommodations deaf people are entitled to, and how exactly those needs get met," interpreter Lydia Callis writes. She offers a primer on Deaf Rights in the Huffington Post and says, "There are a lot of deaf people who complain that VRI does not provide effective communication because the system will freeze, or not turn on, or staff members don't know how to use it. Providing effective communication is key to each situation." But can you refuse VRI without first trying it? Callis answers that question and others here. The Indiana School for the Deaf football team gets a profile from the Indianapolis Star. In the video below, coaches, players and fans are interviewed about the team's amazing turnaround in the last few years. A deaf woman is suing Miami's Baptist Hospital for refusing to provide an interpreter for the upcoming birth of her second child. During her doctor visits, she's been made to write back and forth with pen and paper, rather than have an interpreter. The hospital is already facing one lawsuit over failing to provide a sign language interpreter. Read more the full story in the Miami Herald here. People living in North Dakota no longer have to leave the state to get a cochlear implant, according to KQCD-TV. Find out more in this video report about one family that took advantage of the new opportunity. It's unclear why Timothy Holmes was found dead Wednesday night in a Rochester suburb. The Monroe County Sheriff's Office says the death was not suspicious, according to the Democrat & Chronicle. Read more about the well-known student who appeared in many plays at the National Technical Institute for the Deaf hereand here. A "story of success" about Holmes from the university's Focus magazine was still online here as of Friday afternoon. Closed captioning will be a prominent part of the new video board going up in the arena where the University of Maryland Terrapins play basketball. Read more about the Xfinity Center's center-hung board here. The votes are in and we now know the names of the the National Zoo’s two female American bison. Students at Gallaudet University name one of the bison Wilma while Howard University students picked Zora for the name of the other. Both schools use the American bison as school mascot. Wilma was named after Wilma Newhoudt-Druchen. She became the first deaf woman elected to serve in South Africa’s parliament and is joining the Gally Board of Trustees this fall. DC Zoo officials will announce the name tomorrow of the bison named by Gallaudet students. 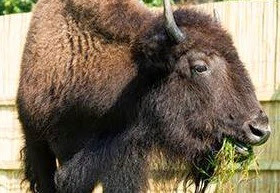 The Smithsonian National Zoo has two female American bison and Gally students are naming one of them, while Howard University students are naming the other. The American Bison Exhibit opens to the public this Saturday (August 30). There's more information here. DeaFestival Louisville takes place this Saturday (August 30) at the Kentucky Center for the Performing Arts. There is more information here. Bonnie Sloan was the first deaf player in the NFL. The Tennessean interviewed him about playing defensive tackle for the St. Louis Cardinals in 1973. Unfortunately, the Tennessean does not include captions, though Bonnie signs his answers. Researchers are trying to replicate the super hearing of a particular fly. They believe harnessing that knowledge could lead to a break through in hearing aid technology. KTVT-TV in Dallas has a video report below. No captions, but you can read the story here. Gallaudet is adding two people to its Board of Trustee. Charlene Dwyer and Wilma Newhoudt-Druchen will join in October. Board Chair Dr. Benjamin Soukup said, "I have complete confidence that their participation on the board, as well as the leadership of our incoming chair, Heather Harker, will ensure our continuing success in serving future generations of Gallaudet students." President T. Alan Hurwitz added, "Both are highly esteemed advocates for the deaf and hard of hearing community as well as for people with disabilities." Dwyer is the Director of Initiatives for MAXIMUS Federal Services, the Operating Support Manager for the Social Security Administration's Ticket to Work Program. Newhoudt-Druchen is a Gallaudet alumna who in 1999 became the first deaf woman to be elected to the South African Parliament. She is presently serving as vice president of World Federation of the Deaf. There's more information from the school here. DEAFestival St. Louis takes place this Saturday at the Kirkwood Community Center in Kirkwood, Missouri. Click here for more information. The Utah Schools for the Deaf and Blind has an interim superintendent. Joel Coleman was appointed to fill in while a search continues for Martell Menlove's replacement. KTVX-TV in Salt Lake City has a video report. No captions but you can read the story here. A county in Eastern Pennsylvania apparently violated ADA law when it failed to provide a certified interpreter for a deaf defendant last month. When Steven Gonzalez appeared for arraignment in Northampton County for charges of theft and receiving stolen property, there was no one who signed. Read the full story from the Lehigh Valley Live here. A toddler died at a home for deaf women in Seattle this week. The 2-year-old fell out of a third story window at the apartment building run by Abused Deaf Women's Advocacy Services. KOMO-TV and KING-TV have video reports. A Georgia judge sentenced a man who killed a deaf cyclist to 15 years, with five years in custody, according to the Atlanta Journal-Constitution. Damon Thomas Latuch hit Joseph "Deaf Joe" Gathambiri with his truck and killed him. Latuch pleaded guilty to first-degree vehicular homicide. He agreed to pay $9000 to Gathambiri's family. Read more about the story here. "Foreign language agencies are notorious for poor reputations in hiring of ASL interpreters. They don't know how to screen because they don't know the language. The outcome is deaf people receive poor and low-quality services," Western Oregon University C.M. Hall told the Statesman Journal. The newspaper looked into allegations that patients at some Oregon hospitals are not getting needed interpreters. Read the full story here. A Pennsylvania boy will get the interpreter he needs to play soccer. The city of Greensburg had said 'no' to the 8-year-old's family until they filed a federal lawsuit. Read more at the Pittsburgh Tribune-Review here. A bill in the US Congress would allow the deaf to serve in the Air Force. California congressman Mark Takano, a Democrat from California, put the proposed legislation before the House Armed Services Committee. H.R.5296 has the support of the NAD (National Association of the Deaf) and covers people who use hearing aids or cochlear ear implants. If approved, changes would begin with a pilot program, which would be expanded if all goes well. Co-sponsors include four other Democrats: Chris Van Hollen of Maryland, Niki Tsongas of Massachusetts, as well as John Garamendi and Henry Waxman of California. Read the proposal here. They are known as the "Electronic Couple" by helping to create the first cochlear implant. The Guardian deems them the husband and wife who "helped the world to hear." Read the full article here. Legal action may be taken against the city of San Diego over what happened at last month's Zombie Walk. It coincided with the yearly Comic-Con event and was marred when a participant was hit by a deaf driver. San Diego's KGTV has a video report below (captions available). Protesters gathered this weekend at Regal Theatres in Rochester, New York to give attention to captioning. Although the movie theater provides captioning enabled glasses, the protesters say the glasses don't do the job. WHEC-TV has a video report. The Second Annual New England Deaf Festival takes place this coming Saturday (Aug 16) in Pulaski Park in Three Rivers, Massachusetts. Admission is only $5. There will be crafts, exhibits, and a car show. You'll find more information here. The requirement would kick in six months after the final rule is published. You've got until the end of next month to comment on it. Read the proposed rule change here. I could not trust anyone. The zombie people surrounded by car. This is how it started… There was a back door that was opened where my girlfirend's sister was sitting. I got scared. That's when I plowed my car through the crowd. I had to do this to save my family. Inside News: "Zombie Walk at Comic-Con Convention" A Deaf Driver & His Story with Captions from i DEAF NEWS on Vimeo. A Gallaudet student is suing NPR for discrimination. Catherine Nugent, who is deaf, was an intern at the national radio news organization last year. Nugent says she expected to be learning about marketing. Instead, the business administration major was told to train employees as to how to sign--even though she does not have ASL teaching certification. The suit says she "was tasked with developming lesson plans for, and teaching, a summer-long daily ASL class for NPR staff." Nugent's lawsuit says she realized she was being "misled" about her internship when it became clear that Nugent was hired, not to learn, but to promote the network's diversity as part of a public relations strategy "to build enthusiasm in the media for its new outreach programming targeting deaf persons.. NPR failed to meet its legal obligations in focusing" on this. NPR fired Nugent after she persisted in asking for accommodations, rather than providing her with interpreters or interpreting software. NPR declined comment. See the full lawsuit here. Deaf West Theater is launching a Kickstarter Campaign in an effort to raise $25,000 and bring their version of the Broadway rock musical Spring Awakening to the stage. If successful, DWT would present the Tony Award winning musical in a way that would connect the deaf and hearing worlds byperformed simultaneously in Spoken English and ASL. DWT did the same thing a few years ago with Big River. The Kickstarter page is here and below in an introductory video about the effort.